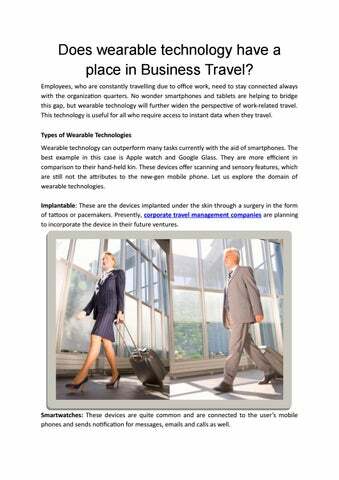 Does wearable technology have a place in Business Travel? Employees, who are constantly travelling due to office work, need to stay connected always with the organization quarters. No wonder smartphones and tablets are helping to bridge this gap, but wearable technology will further widen the perspective of work-related travel. This technology is useful for all who require access to instant data when they travel. Types of Wearable Technologies Wearable technology can outperform many tasks currently with the aid of smartphones. The best example in this case is Apple watch and Google Glass. They are more efficient in comparison to their hand-held kin. These devices offer scanning and sensory features, which are still not the attributes to the new-gen mobile phone. Let us explore the domain of wearable technologies. Implantable: These are the devices implanted under the skin through a surgery in the form of tattoos or pacemakers. 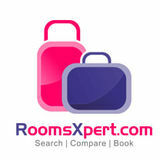 Presently, corporate travel management companies are planning to incorporate the device in their future ventures. Smartwatches: These devices are quite common and are connected to the userâ&#x20AC;&#x2122;s mobile phones and sends notification for messages, emails and calls as well. Smart Clothing: These are specially curated garments made of silver-coated fibers. It can stream information with sensory features and offers real-time data delivery to your smartphone. Head mounted display: Such kind of devices send information directly to your eyes and belong to two categories. For example, Oculus Rift gives you the seamless experience of the virtual world. On the other hand, Google glass offers the option to share pictures, record videos, and search for the much-needed information when you are traveling for work purpose. Benefits of Wearable Technology It is true that the utilization of technological tools helps in day-to-day activities to a great extent. Be it health, communication or recreation, the advantages can be felt everywhere. Traveling for business purpose should be backed by such a technology, which can work simultaneously as a wearable technology. The aforesaid devices will help people to stay updated in terms of work while they travel for corporate purpose. Few of the benefits are as follows: Business travelers seek for 24*7 connectivity so that they can take instant action on the move. Smart watches are a helpful device to get a constant update.